Syncany is an open source Dropbox-like file sync and backup tool. It synchronizes files and folders between computers either manually or automatically. Users can define certain folders on their machine and keep them in sync with friends or colleagues. So what makes Syncany awesome? Excited yet? Ready to learn more? Syncany takes the idea of a Dropbox-like continuous file synchronization tool and applies it to the real world: It makes use of the storage that is available rather than being bound to a certain protocol or backend a certain provider is offering. With a simple plugin-based storage system, Syncany can turn almost anything into a usable backend storage. Right now, it can use folders on an FTP or SFTP storage, WebDAV or Samba shares and Amazon S3 buckets, but that’s just the beginning. Because it’s so easy to implement plugins, more are definitely coming. Even things like using IMAP folders or Flickr’s free 1 TB of image data could be used to store your data. Besides its incredible flexibilty in terms of storage, Syncany is also a very privacy-aware software: User data never leaves the local machine without being encrypted. Data confidentiality and user privacy are the taken very seriously – 128-bit AES+Twofish/GCM encryption is built-in by default. Combining these two features makes Syncany really awesome: You can use all of the free storage that the Internet gives you (Google Drive, OneDrive, etc.) to share your files, but you don’t have to worry about your privacy. Syncany takes care of encryption before files are uploaded. As of today, Syncany is available as a command line tool on all major operating systems. We’re working on a graphical user interface and a web frontend, but until that is ready, you’ll have to make due with the command line. You can either manually trigger the file synchronization like you do with Git, rsync or Unison; or you can let the Syncany background process automatically sync your files. Check out the Getting Started Guide to learn more. If you want to share files with friends or colleagues without having to trust anyone but yourself, Syncany is the right tool for you. If you want to use your own offsite storage instead of a provider-controlled storage, Syncany is the right tool for you. Syncany is not a free or pay-as-you-go service. Syncany is a tool. Syncany does not provide storage. You must bring your own storage. 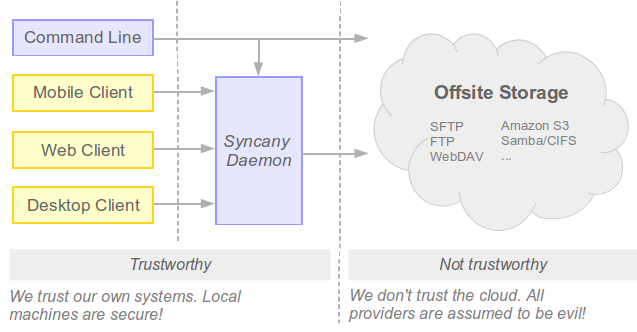 Syncany is not a peer-to-peer network. Data is stored centrally and you must trust the persons you share files with. Syncany has version control capabilities, but it is not a fully fledged version control system like Git. Syncany is not yet usable for critical files. It’s alpha software. Don’t do it! Pim wants to share some ideas with Philipp, and Philipp wants to share some pictures with Steffen. 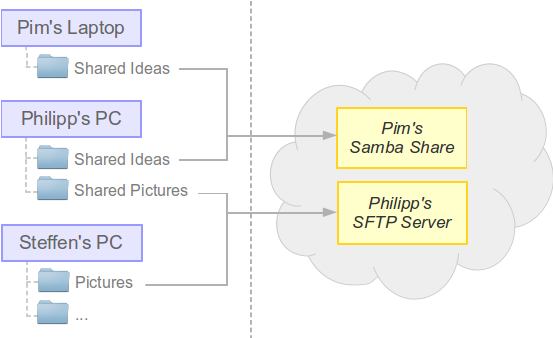 Pim has a Windows server running a Samba server (Windows share), and Philipp has has a virtual server from a random hosting company lying around – all set up with a spare SFTP account. Pim sets up a Syncany shared folder with Philipp, using the shared Windows folder on his server as a backend storage. He uses the sy init command to do that, types in samba to use the Windows share plugin, and chooses a strong password to encrypt the data with. After the one-minute setup, he gets a syncany://-link from Syncany. This link contains all the information required to access the storage. Philipp can now use this and the password to access the Syncany folder (using the sy connect command). Since everything that lands in the cloud is encrypted with a key derived from the password, Pim and Philipp don’t have to worry about a nosy storage provider or other interested parties. The process between Philipp and Steffen is exactly the same, only that now Philipp initializes the repository on his own remote storage, and that the SFTP plugin is used. Note that not all of of the components required for this use case have been implemented completely. We are working on it though. Company XYZ wants their employees to be able to share files on projects X, Y and Z. Since they have a Samba and an SFTP server lying around, they use them for projects Y and Z. The files for project X are hosted on Amazon S3 – but since the data is encrypted, company XYZ doesn’t worry about their files. Armin works on projects X and Y. 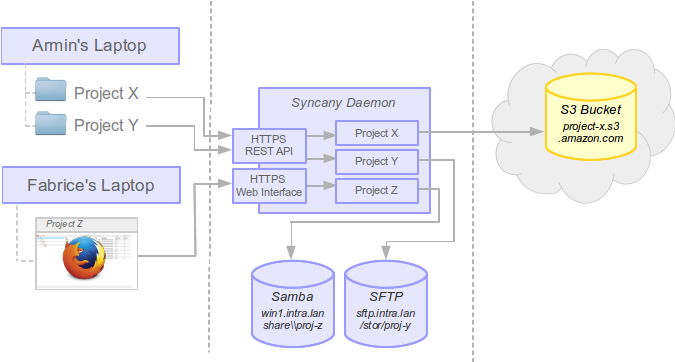 He uses sy connect to connect to the projects repository (via the Syncany daemon). Fabrice doesn’t have Syncany installed, but still needs to browse the files on project Z. He uses the web interface to do that.